Resurrection is a central doctrine of Judaism, Christianity, and Islam. 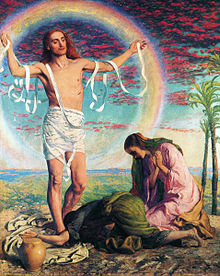 It may refer to the resurrection of biologically dead corpses by divine power or to a purely spiritual resurrection where the 'dead' (human beings who are blind to their spiritual nature and the possibility of salvation) come to Life by means of spiritual awakening and subsequent transformation to a life of holiness. No resurrection comes for one who's dead. We cannot understand the preaching of the resurrection if it is understood as a miraculous moment which founds a new religion. If it is taken thus, we are in fact denying the force and efficacy of the resurrection. For the resurrection brings about the definitive installation in our midst, as a constructive hermeneutical principle, of the cult of Yahweh who knows not death, and who is worshipped in a continuous apprenticeship in participating in and not being scandalised by the collapse of the sacred. A sacred whose secret is always the victims which it hides, and on whose sacrifice it depends. Because Jesus came, died, and was resurrected, O[ld] T[estament] festivals have now been fulfilled, and to maintain them ‘means reverting back to the old covenant, as if Christ had never come. Oscar Cullmann, as quoted in the contemporary Vocabulaire biblique. The fact that we awake from sleep is some evidence for the resurrection. And I have hope toward God, which hope these men also look forward to, that there is going to be a resurrection of both the righteous and the unrighteous. 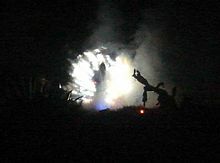 The word "resurrection" has for many people the connotation of dead bodies leaving their graves or other fanciful images. But resurrection means the victory of the New state of things, the New Being born out of the death of the Old. Resurrection is not an event that might happen in some remote future, but it is the power of the New Being to create life out of death, here and now, today and tomorrow. The volume open'd!—open'd every heart! Weakness in and round me here. O, on that glorious day, when all the hosts of God shall have been gathered from Europe and Asia, from Africa and America — when the long-buried armies of the dead shall come forth, spiritual, incorruptible, glorious, immortal — when the sons of God who have kept their first estate, shall sing " unto Him that loved us," and the redeemed from all parts of the earth, and from all the generations, shall respond in a song sweeter than the songs of the morning-stars when all the sons of God shouted for joy,— may you and I be there to join that everlasting song, and realize that bliss unspeakable which is the enduring portion of the Lord's redeemed. And shall they rise, all these? Will there be a trumpet blast so shrill that none of them may refuse to hear it, and the soul, re-entering its shrine of eminent or common clay, pass upward to the judgment? " Many and mighty, but all hushed," shall they submit with us to the judgment of the last assize? And in that world is it true that gold is not the currency, and that rank is not hereditary, and that there is only one name that is honored? Then, if this is the end of all men, let the living lay it to heart. Solemn and thoughtful, let us search for an assured refuge; childlike and earnest, let us conf1de in the one accepted Name; let us realize the tender and infinite nearness of God our Father, through Jesus our Surety and our Friend. How divinely full of glory and pleasure shall that hour be when all the millions of mankind that have been redeemed by the blood of the Lamb of God shall meet together and stand around Him, with every tongue and every heart full of joy and praise! How astonishing will be the glory and the joy of that day when all the saints shall join together in one common song of gratitude and love, and of everlasting thankfulness to this Redeemer! With what unknown delight, and inexpressible satisfaction, shall all that are saved from the ruins of sin and hell address the Lamb that was slain, and rejoice in His presence! This page was last edited on 14 January 2018, at 18:13.